C.S. Wachter isn’t letting any grass grow under her feet (cliche, I know). But it was just a few short months ago on February 16, 2018 that her first book, The Sorcerer’s Bane was published and got rave reviews. The Sorcerer’s Bane introduced us to Prince Rayne, or the slave boy, Wren, and his story wrenched my heart and made me love him and want him to survive. This first book also gave us hope as it introduced the One and his work in Wren’s life. 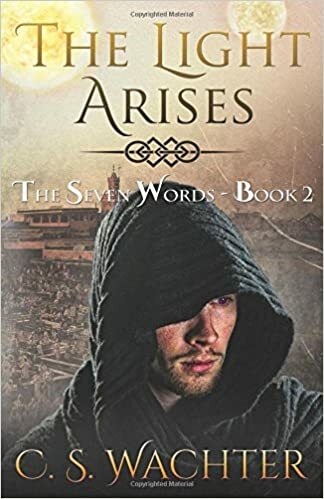 Now, in Book 2 of “The Seven Words” series, The Light Arises, releases on May 29, 2018, C.S. Wachter does not disappoint. As a matter of fact, I was pleasantly surprised to find that I liked The Light Arises even better than The Sorcerer’s Bane. This, to me, seems an unlikely feat from a debut author, but C.S. Wachter has nailed it. She has proven that she can definitely write a story that will hold my interest, make me love the characters and cheer for them; make me laugh with them and cry with or for them. An author who can evoke that much emotion within me while I read his or her words is an author with longevity as far as I’m concerned. In The Light Arises, Rayne struggles with relationships in his home on the world of Ochen. Though he is the Prince, he has been gone for many years and has recently returned. While he was gone, his parents, King Theodor and and Queen Rowena, have devoted themselves to Rayne’s cousin, Brayden. There have been problems between Brayden and Rayne since they were young boys, but now Brayden is insufferable. He is the cause of a strain between Rayne and his parents, so Rayne feels the need to leave his home. He is not happy to leave the parents he has just been reunited with, but the One has called him for a higher purpose. He is to be the Light Bringer who is to find the seven words hidden on the seven worlds in order to defeat the darkness. He is to begin by bringing light to Veres, a world one can only enter if involved in the brutal games arranged by the Sorial merchants. Rayne is forced to become slave Wren once again to infiltrate the games to skip to the isolated world. Still more trouble awaits in the form of a golden-haired girl who has vivid memories of the day an assassin came and destroyed her world and disabled her father. She plans to kidnap the prince in order to get King Theodor to help her people. As I said, this book doesn’t disappoint. There is still lots of action and battling the forces of evil, as well as a promised hope. The Light Arises kept me turning pages to the very end and I eagerly await Book 3 of “The Seven Words” series by C.S. Wachter. My only question is: will Book 3 be even better than Book 2? If you like Christian Fantasy stories, I highly recommend these first two books in “The Seven Words” series by C. S. Wachter. If you’ve already read The Sorcerer’s Bane, you don’t want to miss The Light Arises. If you haven’t read The Sorcerer’s Bane, what are you waiting for? Read it and then grab The Light Arises and keep reading!